McKim Observatory, 1884. Listed on the National Register of Historic Places. 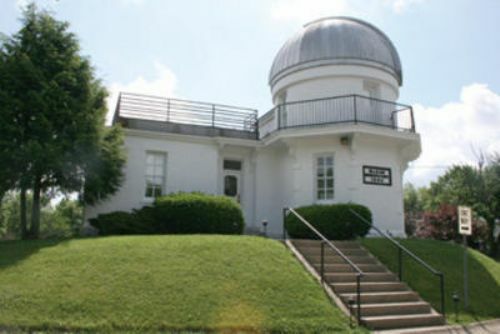 DePauw University's McKim Observatory, on the National Register of Historic Places, is an excellent example of a well-equipped late 1800's observatory. The Observatory houses many of its original instruments, including a 9.53 inch Clark refracting telescope and a Fauth and Co. meridian circle transit telescope. Located in a residential neighborhood approximately one kilometer from the main campus, McKim is currently used by: students enrolled in astronomy classes, independent student research projects, and the public during open houses.